The new! Korg TRITON taktile-49 is a 49-key Keyboard Controller with 512 Triton Synth Sounds, Touch Pad, 16 Trigger Pads, 8 Switches, 8 Sliders, and DAW Transport Controls. Whether you are producing or performing, you will be impressed with the Korg TRITON taktile-49. Not only is it one of the most powerful keyboard controllers, it includes 512 sounds from the best-selling Korg TRITON keyboard workstation. In addition, you have got impressive DAW control, ultra-creative command over your synths and virtual instruments, and tons of iconic Korg sounds right at your fingertips. From sweeping pads and searing leads, to vibrant EPs and organs, the TRITON taktile-49 is perfect for adding something special to your productions and performances. The TRITON taktile-49 is loaded with an X-Y pad that offers you on-the-fly sound manipulation that goes way beyond what you can do with a mod and pitch wheel alone. And with the press of a button, you can also use it as a trackpad to control your mouse pointer on your computer. The ribbon controller below it can also be used for left and right mouse clicks, a perfect match for your laptop because you never have to touch your laptop when you are working with the taktile-49. Perform and produce with full DAW control. The TRITON taktile-49 boasts dedicated transport controls including buttons for stop, play, record, loop, rewind, fast forward, and add markers. A set of eight assignable sliders, encoders, and buttons complete the picture. And if you are performing live, it’s velocity-sensitive pads can trigger individual notes, or use the Chord Scale feature to trigger chords based on the scale you have selected. The Touch Scale function lets you generate melodies just by swiping the touch pad, in the scale and key you specify. And you get fifty different rhythm patterns with the built-in arpeggiator. Ready to play your favorite software or hardware synthesizers? TRITON Sounds in a Robust 49-key Controller! The new! Korg TRITON taktile comes in 25-key and 49-key. Korgs’s new taktile range of keyboard controllers and synthesizers comes in two lines: taktile, which comprises straight MIDI controllers, and TRITON taktile, which adds 512 of built-in sounds taken from Korg’s Triton workstations. Both lines come in 25-key and 49-key varieties. 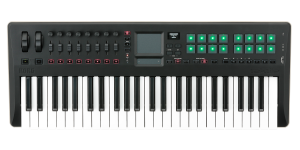 The new Korg taktile 49 is a 49-key Keyboard Controller with X-Y Touch Pad, 8 Trigger Pads, 8 Encoders, 8 Assignable Switches, 8 Sliders, and DAW Transport Controls. The taktile-49 is loaded with clever hand-on functions and an amazing semi-weighted keybed. Korg’s taktile-49 USB keyboard controller makes accessing the full potential of your virtual instruments and DAW software easy and more inspiring than ever. The taktile-49 is loaded with an X-Y pad that offers you on-the-fly sound manipulation that goes way beyond what you can do with a mod and pitch wheel alone. And with the press of a button, you can also use it as a trackpad to control your mouse pointer on your computer. The ribbon controller below it can also be used for left and right mouse clicks, a perfect match for your laptop because you never have to touch your laptop when you are working with the taktile-49. Perform and produce with full DAW control. The taktile-49 boasts dedicated transport controls including buttons for stop, play, record, loop, rewind, fast forward, and add markers. A set of eight assignable sliders, encoders, and buttons complete the picture. And if you are performing live, it’s velocity-sensitive pads can trigger individual notes, or use the Chord Scale feature to trigger chords based on the scale you have selected. The Touch Scale function lets you generate melodies just by swiping the touch pad, in the scale and key you specify. And you get fifty different rhythm patterns with the built-in arpeggiator. Ready to play your favorite hardware or software synthesizers? A powerful 49-key Controller for Virtual Instruments and DAWs.